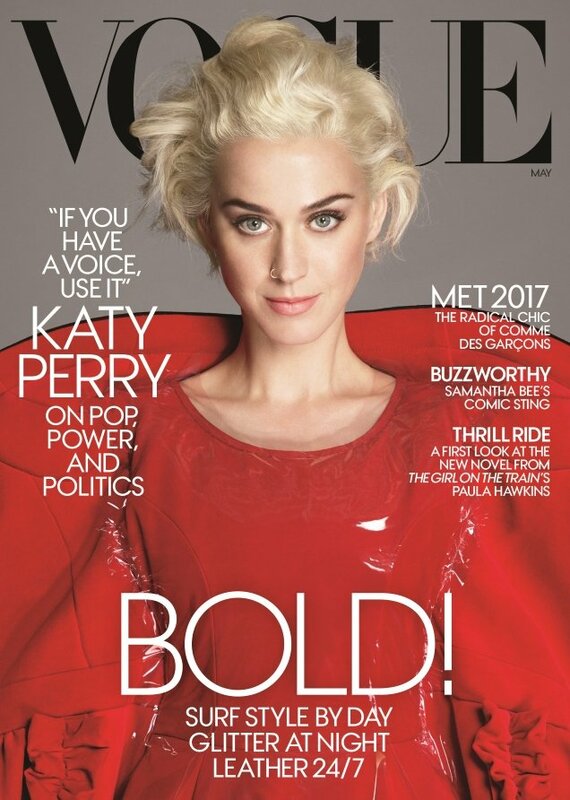 We’ve been bracing ourselves for a Katy Perry cover of Vogue for months, and following a gorgeous Selena Gomez cover last month, Katy finally turns up on the May 2017 issue. The American songstress returns to Vogue‘s front cover to coincide with this year’s Met Gala Rei Kawakubo/Comme des Garçons exhibit, of which she is co-chair. Shot by photographic duo Mert Alas & Marcus Piggott and styled by Grace Coddington, Katy wears a bold Comme des Garçons creation (obviously), complete with platinum blonde hair and fairly minimal makeup. Sadly, our forum members were not fans of the cover. “BOLD? More like CHEESY and BORING. I believe this is the first time CDG gets such a major American cover in a longtime. What a waste,” cried out an unforgiving Lola701 the moment the cover struck. “This is possibly the worst cover from them I have seen in recent years, and they’ve had a good share!! Tragic hair, empty art direction! Even ELLE does better than this!” said Miss Dalloway. “Wow. I second that, this is one of the worst covers I have ever seen them produce. Katy can photograph well, she’s extremely photogenic, but seriously. This just is a non-starter for me! Eyesore of a cover,” honeycombchild echoed. Also not rushing to the newsstand was tigerrouge. “It’s a waste of Katy Perry, and it’s probably the worst I’ve ever seen her look,” she declared. “That hair will appear in my worst nightmares, and that piercing too! The CDG looks really off in the cover. How could anyone say YES to this?” asked Creative. “All this did was show how much these celebs will look ridiculous if they try to wear Comme des Garçons at the Met Gala,” laughed Marc10. See more from Katy’s new Vogue cover shoot and join the conversation here.